A lighthouse is a symbol of hope, a literal beacon of light that beckons the storm-tossed wanderer safely onwards as they journey home. Representing solid dependability, noble dedication, and the call of the sea, lighthouses are also simply a favorite destination for those who love the coastal beauty of those points where the ocean meets the shore. 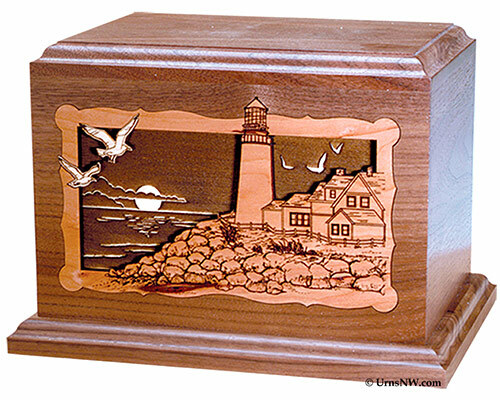 All this and more makes the lighthouse a popular and fitting theme for a memorial urn, especially among those who treasure the memories of lighthouse touring and beach trips enjoyed together. So below we have gathered the 13 most beautiful lighthouse cremation urns we’ve found across the web. These include wood inlay art, laser etchings, hand-painted ceramics, and more. 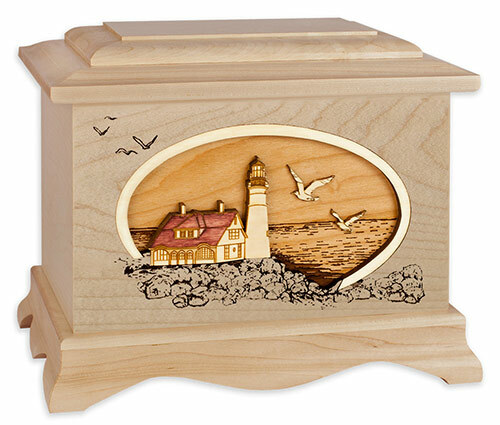 We’ve profiled our 3D inlay lighthouse cremation urns before, so you can check that out for a closer look at those ones, but this list below includes all the most beautiful lighthouse-themed urns so you can choose your favorite. 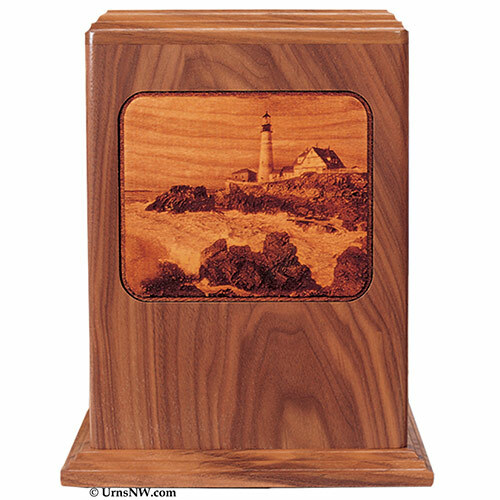 A new addition to our line of 3-dimensional wood inlay art urns, the Portland Head Lighthouse Cremation Urn depicts the famous Maine lighthouse overlooking Cape Elizabeth. Available here in multiple wood types in standard adult size (pictured above in Maple, also can come in Walnut, Oak, or Mahogany). Companion size for the remains of two people is available here. 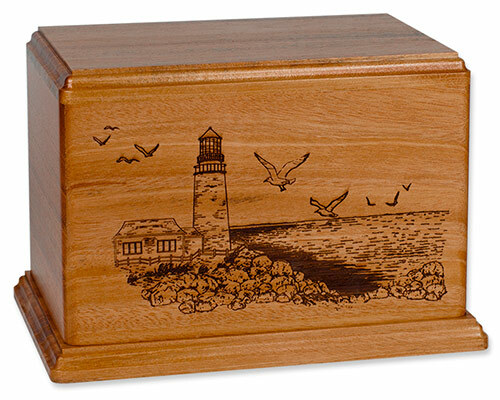 A longtime favorite, this design has been one of our most popular lighthouse cremation urns since the early 2000s. The elegant shape is perfectly articulated and nicely complements the overflowing coastal oval design. Available here in standard adult size, and here in companion size. Another elegant design in the stunning 3-dimensional inlay art style. Available here in your choice of Walnut wood as shown or a gorgeous Oak. Companion size for two people can be found here. Another of our newer lighthouse cremation urns, the Cape Hatteras memorial urn presents a lovely beachside view of the most famous lighthouse in North Carolina. Available here in four wood types and your choice of standard/companion size. Love the 3-dimensional inlay art style? We have nearly one hundred themes and styles available here. These include sailing, beach, dolphin, and other ocean themes. 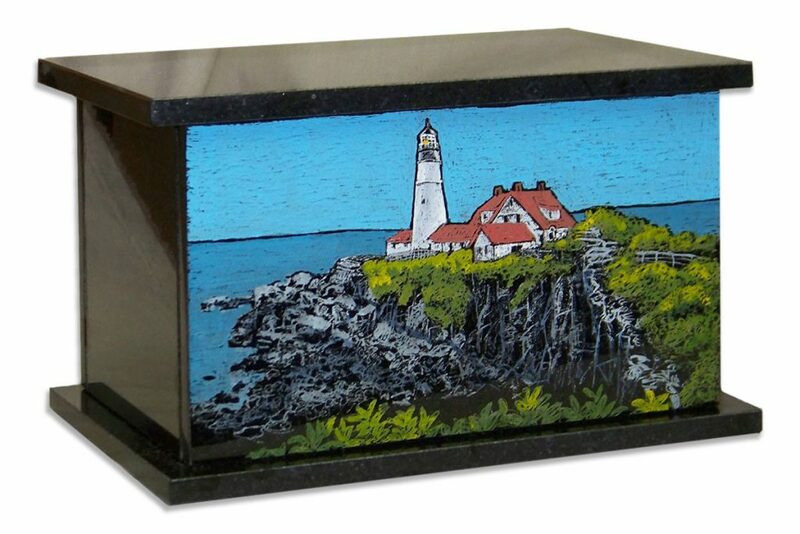 Moving away from wood urns for a moment, here we have a lovely and durable black granite urn with a colorful hand-etched scene of the iconic Portland Head Light. Available here. More designs and themes in this creative hand-etched granite urn series can be viewed here. 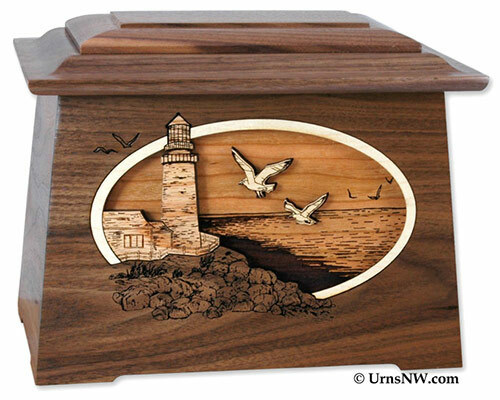 This unique urn features an inlay panel with a laser etched photograph of a lighthouse overlooking the rocky coastal shoals. The layout provides an ideal space for custom laser engraving of name and dates. Available here. 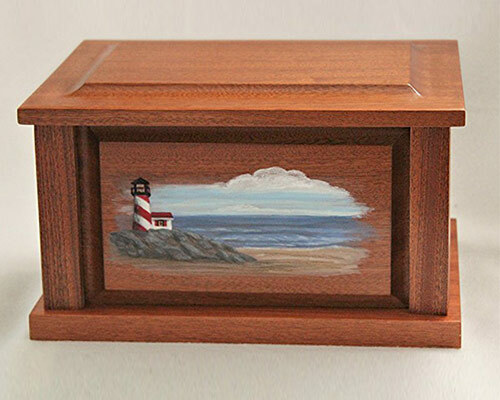 Handcrafted in the USA from sapele mahogany, this gorgeous wooden lighthouse urn features a peaceful oceanview scene painted by hand by a local artist. Available here. If you like the art painting on wood style, you can view a few more of these designs here. A gorgeous relief carving of a lighthouse with soaring seagulls sets this memorial apart. Made in the USA from solid mahogany wood and etched in fine detail. Available here. 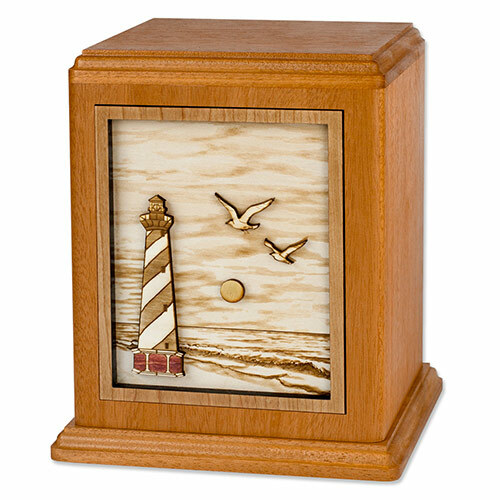 Made in the USA from your choice of cherry, maple, or mahogany (pictured), this rustic and affordable urn is a lovely tribute to anyone who loved lighthouses. Available here. 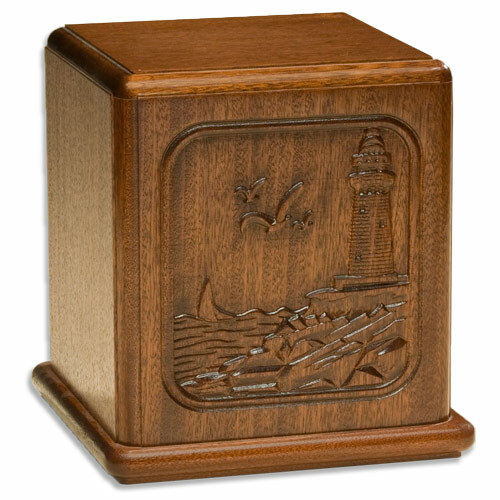 If you like the elegant and rustic simplicity of this item, check out all of our Laser Carved Cremation Urn Series. Rich reds, oranges, and yellows evoke the rich palette of an ocean sunset. 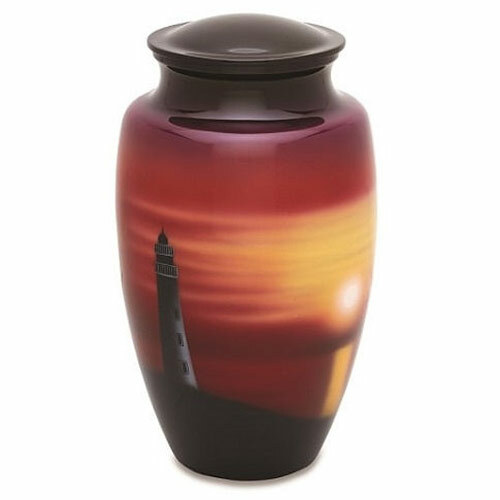 This metal cremation urn is artfully painted by hand and features a brilliant finish. Both affordable and elegant. Available here. 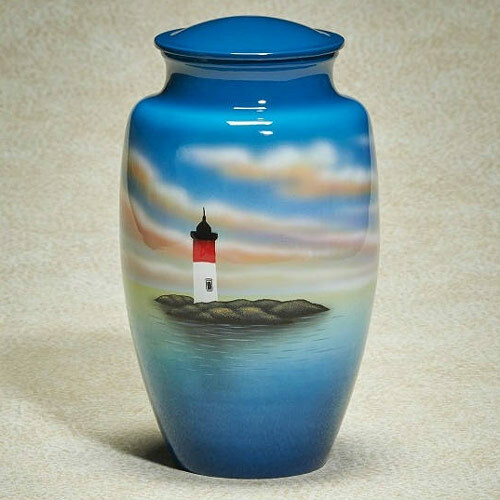 This hand-painted Island Lighthouse Cremation Urn boasts rich blues in the sky and sea. Artisans carefully hand-paint each memorial, so no two of these lighthouse cremation urns will be exactly the same. Once the art scene has been painted, several layers of lacquer are applied to provide a protective coating for a lasting, lovely ocean memorial. Available here. If you like these hand-painted metal urns, more designs and themes can be found here. 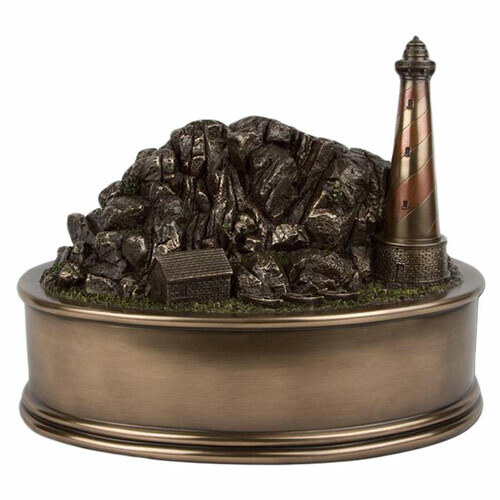 A gorgeous cast sculpture of a lighthouse set into the rocky coastal landscape. Available here. 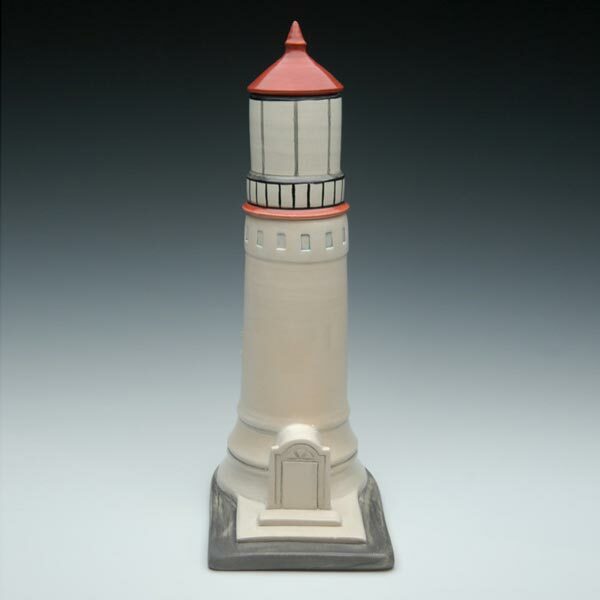 This handmade ceramic lighthouse urn is the perfect combination of attractive art piece with unobtrusive cremation urn. It’s such a beautiful sculpture no one will realize it’s actually a funeral urn. Best of all, it’s individually handmade to order by the artist right here in the USA, and available here.